The city has the second-highest gross value added (GVA) per resident (behind London) in major UK cities, with the average being £34,178 per resident. The employment rate for the city stood at 73.6% for Q1 of 2013, which was higher than the rate for Scotland as a whole, which stood at 71.8%. 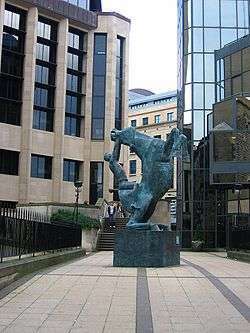 A sculpture outside Standard Life buildings on Lothian Road. The area is at the heart of an expanding financial district. Edinburgh is the third-largest financial centre in the United Kingdom after the City of London and Glasgow and the fourth in Europe by equity assets, and is at the centre of a financial services in industry, which in Scotland achieved a growth rate of over 30% over the period 2000 to 2005. Edinburgh has been a centre of banking for over 300 years; the Bank of Scotland was founded in 1695, by an act of the original Parliament of Scotland, and is now part of the Lloyds Banking Group, who have kept the Scottish headquarters in Edinburgh. 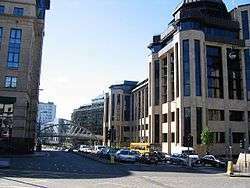 The Royal Bank of Scotland (RBS) also has its global headquarters in Edinburgh, operating from a complex at Gogarburn and opened in October 2005. The bank was founded in 1727 by Royal Charter and is now the fifth largest in the world by market capitalisation. In 2000, the Royal Bank of Scotland acquired the National Westminster Bank in the biggest banking takeover in British history, to create a group with an expanded portfolio and a global outreach. Ulster Bank, Direct Line and Coutts constitute some of the other operations that are part of the RBS group. On 7 October 2007, a consortium led by RBS announced the successful acquisition of ABN AMRO, further growing its significance. Tesco Bank, as well as Virgin Money also have headquarters in Edinburgh. The New Town and city centre has traditionally been home to many companies, in the banking, finance and legal professions, but modern needs have caused many to relocate. Immediately to the west of the city centre is the Terry Farrell master-planned Exchange business district, which now houses major employers such as Scottish Widows, Standard Life, the Clydesdale Bank, and Baillie Gifford. Edinburgh has an estimated 17,136 people working within digital companies. The technology sector has grown upon the expertise within the city’s universities. The city has seen a growth in the number of software companies in the city over the last 10 years and there are now more than 100. These include travel search website Skyscanner and one day fantasy sports provider Fanduel who have grow within the city. 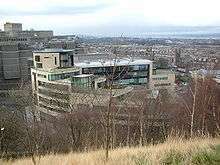 Several large corporates have invested in Edinburgh including Amazon Development Centre Scotland and Microsoft. One of the main reasons behind the growth in the number of software companies is the highly skilled graduates from the University of Edinburgh’s world-leading School of Informatics. The School of Informatics is the UK’s largest and longest established research group in informatics. In the REF 2014 assessment for computer science and informatics the School of Informatics has produced more world-leading and internationally excellent research (4* and 3-star) than any other university in the UK. Edinburgh's high quality of life also helps companies to attract skilled workers from around the world. Tourism is another important mainstay of the economy of Edinburgh, supporting 30,000 jobs in the city worth £1.6 billion to the city economy. In 2011, visitor spending was £1.16 billion, compared to £250 million in 1990. Edinburgh is Scotland's most popular tourist destination in terms of visitor numbers, with numbers growing substantially each year, particularly in the budget travel and backpacking sector, assisted by the growth of Edinburgh Airport and direct rail links to the rest of the country. The annual Edinburgh Festival attracts record numbers, as does the Hogmanay street party each New Year, with over 4.3 million visitors attending Edinburgh's various festival events over 2012. The Edinburgh Festivals in August alone generate in excess of £100 million for the Edinburgh economy. Another component of Edinburgh's tourist industry is business and conference tourism, which generates in excess of £74m for the city. Edinburgh is the UK's most popular conference destination, ahead of both London and Glasgow. Visitors are attracted by the UNESCO World Heritage Sites of the Old Town and the New Town as well as the history and culture of the city most visible in tourist attractions such as Edinburgh Castle and the Palace of Holyroodhouse. Edinburgh is a major centre of education in the United Kingdom, and has been since the establishment of the University of Edinburgh in 1583, with another three major higher education institutions in the city developing later. Education and academic research (including medical research) plays a significant role in the economy of the city. The presence of these educational institutions also attracts many overseas students and those from the rest of the UK. There is currently a student population of 57,850 enrolled in universities across the city. The city is linked internationally by Edinburgh Airport (EDI) which in 2012 saw almost 9.2 million passengers throughout the year, which makes Edinburgh Airport the sixth busiest in the UK, despite a 2% drop in passengers from the previous year. In terms of rail connections, Edinburgh Waverley railway station is the principal mainline station in the city serving over 22.5 million passenger journeys over 2011–12. The Edinburgh Trams, completed in May 2014, consist of 15 tram stops along the single 14 km (8.7 mi) line. The route links Edinburgh Airport in the West, to York Place in the East. ↑ "FDi European Cities & Regions of the Future 2013"
↑ "Scotland's Census - 2011 Census: First Results on Population and Household Estimates for Scotland - Release 1B"
↑ "ONS - Regional Gross Value Added (Income Approach), December 2012"
↑ "Edinburgh Economy Watch - October 2013"
1 2 3 4 5 "Edinburgh by Numbers 13/14"
↑ "Scotsman 2013 - Only London beats Edinburgh on productivity in UK"
↑ "Waverley station overhaul to create city 'piazza'". The Scotsman. 2013-05-19. Retrieved 2013-11-28. ↑ "Our company". Lothian Buses. Retrieved 2013-11-28. ↑ "Tram Route Map and Stops". Edinburgh Trams. Retrieved 16 April 2015.